It’s been crazy busy, so I have two months’ worth of library bookspotting to catch up on, but lucky for you, it’s worth it. Here goes! My library has a pretty respectable collection of Spanish language books for all ages. 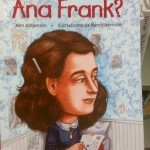 This one is meant for early readers and asks the literary question “Who was Anne Frank?” (and why did she have such a gigantic head?) We have a whole collection of these “Who was” children’s biographies, and all the heads are huge. 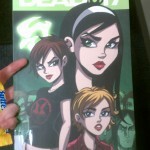 Sorry, Anne, but this caricature-like cover really doesn’t add to the somber tone. I often rip on serial mysteries and how hokey their titles often are, but this one has the double whammy of a horribly puntastic title and an equally ridiculous cartoon cover image. I do like that they included the whitewashed fence in the background, I just wonder what they called the Tom Sawyer version. 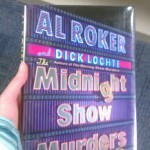 Did you know that Al Roker also wrote mystery novels in his spare time? Neither did anyone else. At least it doesn’t bear the characteristically punbelievable title convention, but all of his mysteries are set on the set of a talk show, which is a little uninventive from the likes of Al Roker. I just couldn’t resist snapping a pic of this early reader that got returned right after the election. 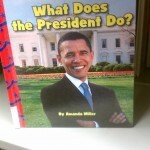 Regardless of what political side of the fence you’re on, it’s a fair question to ask. Some might be surprised to learn that this book actually contained pages. 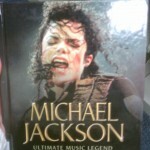 I was a little taken aback by this children’s biography only because I can’t believe they couldn’t find a picture of Michael Jackson that didn’t look like his face was scratched up by an angry cat. There are probably more pictures of Michael Jackson than there are McDonald’s fries in the world’s landfills, and yet this is the one they put on the cover. That’s all for this episode! 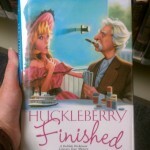 Stay tuned for more horrible library finds as the holidays wear on. Previous Post Foreword, Introduction, or Preface? Next Post The passive-aggressive breakup: It’s not you, it’s me.